TIRANA, March 16 – The united opposition protested on Saturday again against the Rama’s government, which it accuses of winning the last elections through illegal ballot buying. The protest’s main demand is a caretaker government which can facilitate early elections. FORUM: Is Russian influence real? [post_content] => TIRANA, Feb. 18 - The US Department of State published on Friday its annual report on the implementation of human rights in Albania where, once again during 2018, problems such as corruption, ballot-buying, the deadlock the judicial system is facing due to the justice reform, the impunity of senior officials and the threats to media freedom were reported. [post_content] => TIRANA, March 16 - The united opposition protested on Saturday again against the Rama's government, which it accuses of winning the last elections through illegal ballot buying. The protest’s main demand is a caretaker government which can facilitate early elections. The joint opposition protest in Tirana was accompanied by tensions in front of the parliament, when protesters tried to break the protective police line. Police used tear gas, while protesters were reported to throw strong items to law enforcement officials. Later, in front of the parliament, police also used water to disperse protesters. Some protesters were injured, falling on the ground, along with police officers. A day after the protest, police notified it arrested 14 people and is searching for seven others, all to be punished for the acts of violence during the rally. For 11 other protesters, criminal proceeding has began in a free state. The same decision was reached for the Secretary General of Democratic Party Gazmend Bardhi, as he was the person who requested permission to protest. For its part, the DP accused the police on Sunday of escalating unprovoked violence towards the protesters with the sole purpose of scattering them, scaring them and keeping them away from the protest, but that it got its answer from the people. Opposition leader Lulzim Basha denied criticism that the opposition’s decision to resign its parliamentary mandates is destabilizing the country. "Albania is destabilized by crime, we will put an end to this destabilization, Edi Rama should leave an hour early," said Basha. The president of Albania, Ilir Meta, who cut his visit to Azerbaijan short, reacted on Saturday. He said that he is following the developments with concern, and has called for the avoidance of confrontation and violence. In a later interview, Meta added that all political parties involved in the serious deadlock that’s been created should take responsibility and not hide behind international representations in the country. “I think that the political class should assume its responsibility and not hide behind any international as it has been so far and issues should be resolved in a transparent, principled manner, away from the bargains and misuses even of any internationals,” Meta said. Meanwhile, both the US Embassy to Albania and the EU Delegation warned ahead of the protest that violence during rallies is “illegal” and “intolerable,” through two different statements. The international community has openly criticized the opposition's decision to abandon  parliament by resigning their lawmakers’ mandates collectively. The protest was organized in the form of a march, where protesters "symbolically" surrounded the Prime Minister’s Office, and then proceeded to parliament. The citizens’ march and symbolic siege continued under the sound of a song "My country" and was headed by two opposition leaders, Democratic Party leader Lulzim Basha and Socialist Movement for Integration leader Monika Kryemadhi. About 1800 police officers were committed to ensure the protest would run smoothly, staying around the perimeter of the Prime Minister's Office. This is the opposition’s fifth protest, which kicked off on February 16 in front of the Prime Minister’s Office and continued with several protests in front of the parliament. The united opposition accuses the governing Socialist majority of winning the elections through ballot buying. In protest, the opposition resigned its parliamentary mandates. On Thursday, German Minister of State Michael Roth told Deutsche Welle that they consider the opposition’s parliament boycott is irresponsible. Meanwhile, rapporteur for Albania in the Foreign Commission Christian Schmidt thinks the government is also responsible for the crisis. "This is not normal. The parliament lives by debate. It is up to the government to guarantee parliamentary cooperation,” said the former German minister for DW. Schmidt has been Albania’s rapporteur at the Bundestag’s Foreign Commission for a year - one of the commissions that decide to open EU negotiations for the country. Schmidt told DW that he plans to travel to Albania soon to be informed about the situation. "I particularly want to see how much the opposition is involved in parliamentary procedures," he stressed. Germany's decision to open negotiations will depend on the progress report of the European Union Commission that will be published on May 29th. But to give final approval to the EU Council on 19 June, Germany will have to get the Bundestag's approval. 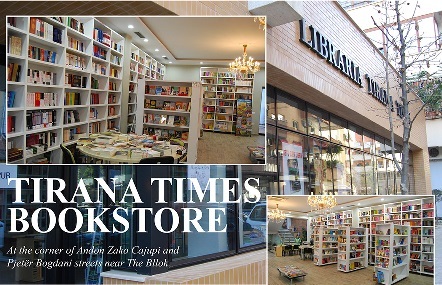 Tirana Times approached a number of prominent Albanian scholars and international relations and foreign affairs experts with the following question: "Recently here has been talk of growing Russian influence in Albania. What are your thoughts concerning this and in what areas or fields may this influence more easily manifest?" Russian influence in Albania has been the most limited among the Southeastern countries and it has been so continuously since the rupturing of relations between Soviet Union and Albania in 1961. Traditionally there has been meagre political relations, little economic exchange, as well as little geopolitical interest from Russia vis-a-vis Albania, while Albania, especially in post-communist period has continuously kept a staunch Euro-Atlantic orientation. Most of the relations between the two countries have been in developing social and cultural networks and in recent years some interest in tourism. Albania was also among the first W. Balkan countries to join NATO in 2009, which Russia accepted without much fuss, given the natural pro-Western inclination of Albanian political elites and widespread popular support for American and European allies. Whereas, in the case of Montenegro and North Macedonia joining NATO, the reaction of Moscow has been quite acrimonious. Lately, Moscow has been quite active in organizing cyberwarfare, which consists in chiefly distributing disinformation and propaganda via Sputnik, Russia Today or other state-supported agencies, directed chiefly at populations of Western European countries and USA. Also it has effectively used internet trolls to spread certain messages and fake news as a means of information warfare. Albania is not particularly the focus of FSB, GRU and other Russian intelligence services that have supported in other countries such cyberwarfare mechanisms but it cannot be taken for granted that such risks are totally negligible in the future. There is indeed a return of the geopolitical rivalry between the Great Powers both at the global scale as well as in specific regions such as the Balkans. What can be claimed with certainty now is the fact that international relations are in a transitory phase when it comes to relations between Great Powers. At the geopolitical level there seems to be a retreat of the United States from the omnipresent position at the global arena and an increase of the efforts of China to assume a greater role in the international level at least with initiatives such as the One Belt one Road project, as well as the 16+1 initiative, in which Albania is part of. Russia is without doubt one of the global great powers that has been trying to reclaim and restore its privileged and ambitious status with a number of concrete initiatives pertinent to its relations to the US, EU, the West in general and the critical region of the Balkans in particular. In addition to the concrete interest that Russia, just as other powers, might have in the region, the Balkans and their issues are used as a proxy for the ambitions of Russia of obtaining a new status in the international relations sphere. This is not a secret. For some countries in the Balkans, there exist numerous historical, geopolitical, cultural and religious reasons which favor a special relation with Russia. This is definitely not the case of Albania which does not have any dilemma about its own pro-western orientation. However both the pro-Western approach and the real integration of the country in the democratic world are not matters of foreign policy. First and foremost they concern the building of a functional democratic society and the overall development of the country according to the democratic model. The latter is very different from the autocratic and populist regimes or even sultanates to which the one in Albania is starting to resemble increasingly over time. This is the real danger in Albania and in some other countries too. I have followed closely and with disappointment the efforts of the government and of the media close to it to invent ‘an enemy’ of Albania’s path towards integration in the European Union. This alleged enemy that is an obstacle for Albania to be integrated with the EU is Russia and her influence over the Albanian opposition. This is an amateur effort and a ridiculous one. Albania’s membership in NATO, the departure of Albania for the absurd isolationist regime, the abolition of the visa regime with the EU countries are all outstanding achievements of today’s opposition. The Democratic Party has been the only one that has had no dilemmas about the pro-western approach in foreign policy. I think that suing the important institutions of national security, such as the Intelligence Service, for purposes of the internal political fight is very clearly wrong and has a very damaging impact. There is a serious concern on the russian influence in our region during the last ten years, however the threats have increased specifically during the last couple of years. The fragile and hybrid  democracies in the region mixed with an increased violation of liberties and freedom in many countries in the Balkans due to increased authoritarian and oligarchic regimes, have made possible for Russia to penetrate easier in a region where EU could not do enough and was slow and late in assisting its full integration. The current Russian influence in the region has also directed towards illiberal economies in the Balkans and has taken a new economic and financial dimension apart of the military and cultural one. Albania is not only not immune but there is an increased offshore russian venture in the country and higher cultural and media investment. It is a fact that in recent years there has been a noticeable increase of Russia's attention to the Balkans with the aim of preventing or minimizing the Euro-Atlantic progress of the countries in this region. For many geopolitical reasons, Tirana has a specific importance regarding developments in the Balkans. This importance has increased significantly after Kosovo’s independence and the Ohrid Agreement in North Macedonia. Consequently, Albania can not be out of Russia's attention. On the contrary. But Albania shares the most pro-European and pro-US public opinion in the region. This public opinion rejects any political approaches to Russia. Moscow has adapted to this reality. I believe that the information provided by the Albanian intelligence chief in the Parliamentary Security Commission has been credited with the fact that Russia is financing ovulatory media and portals in our country. A fresh example: in the five-year anniversary of the annexation of Crimea by Russia, many media aiming at national diffusion and many portals, published a long written statement by the Russian ambassador in Tirana regarding this event. And there was no publications to express the West's point of view, which is officially the point of view of the Albanian government. Impossible to directly influence political decision-making, Russia aims to shed confusion on the Albanian public opinion. If this continues, in the long run, the damage will be significant. There came a point where I noticed signs of Russian influence in the behavior of Prime Minister Rama. Supported by Serbia, Russia is seeking to play an equal role with the EU in the Pristina-Belgrade negotiation process. In Kosovo, this seems to have only taken the approval of President Thaci. Supporting President Thaci against Prime Minister Haradinaj and Parliament, the Albanian Prime Minister in fact helps the Russian efforts to take on a qualitatively new role in the future architecture of the Balkans. Albanians are by far the most pro-Western, pro-American and pro-European people in the region. So Russian influence cannot be traced in the classical forms it manifests itself in other neighboring countries. Yet there are two instances, Russian model of government and policy, that have surfaced in Albania. First, the model of government; what has been called Putinism. Albania has more resemblance with Putinism, a modern authoritarian system than the democratic system stipulated in the constitution. There are no independent institutions, no checks and balances in place, captured national economy through oligarchs, captured judiciary, strong media control and censorship,  rigged elections with massive vote-buying through criminal money, all flagrant elements of state capture. Basic rights have been jeopardized and poverty has reached alarming levels, 47 % of the population live up to 4 euros a day. Instead of rule of law, Rule of Rama is the only standard set in the country. Albania has entered its second year without a Constitutional Court, and no one knows when it will be set up. This is an unprecedented and extremely dangerous development that has threatened basic rights. The General Prosecutor has been appointed by the government with less than simple majority, while the Constitution requires Qualified majority voting. According to the State Department report, Interpol and other reports, Albania is the main supplier of cannabis to Europe; a main gate for supply of cocaine and heroin to Europe, and a base for the operations of the regional organized crime. The second dimension of Russian influence is manifested in the proposal for land exchange, or border corrections, between Kosovo and Serbia. This proposal runs against the very foundations on which is build  Western Europe after the Second WW, and Europe after the fall of the Berlin Wall. This proposal will open the Pandora's box and threatens what has been achieved in the Balkans in the late 20 years. Inevitably this will set in  motion the process that will result in the destruction of Bosnia and Macedonia, with far reaching consequences for the security of the Balkans and Europe. Border corrections, land exchanges and ethnically clean states, are not Western ideas, but Russian ones. Russia needs a precedent that it can apply to its neighboring countries and ongoing crises in its neighborhood. The Albanian Prime Minister is one of the main sponsors of this idea. Russia presence in the region in order to create destabilization and obstruction to the advancement of the Western Balkan countries towards NATO and EU has been one of the objectives of Putin’s foreign policy .The last visit to Belgrade was an attempt to give messages not only to Serbia but to the region. The failed efforts in Montenegro ,in  Northern Macedonia and recently even with Greek  authorities in the case of implementation of Prespa  Agreement is indicative of the fact that even in the countries where Russia is certain to have support in pro -Russian  population or political segments or religion affiliation proves that the euro- Atlantic agenda is far stronger. Voices to start changing borders   in the region might create grounds for favoring Russia influence in this part of Europe and give Russia a strong card to use it as an excuse for its interference   in violation of territorial integrity of certain countries around Russia. In Albania, the most pro NATO and pro EU country in the region, there is no grounds  for increase of Russian influence with all attempts for that by diplomatic presence which is in the normality of the work and mission of diplomats of all countries. There are failed attempts in some segments in media to portray Putin’s Russia as democratic or pro western as well as playing important   global role in resolving crises like that in Syria or to imply that the protests of the opposition against the government might be incited by Russia. With that interpretation what about anti- government protests in Belgrade which in no way can be linked with Putin? With all that Albania needs to  accelerate efforts to advance in EU agenda and EU on its side should  be on the alert to keep up with the EU project in the WB and leave no room for other regressive projects and actors. I hope in the months to come this will not remain a wishful aspiration. In addition to recent talks, this is actually a much-debated topic, not just for Albania, but for the entire region. The Western Balkans is a region where interests collide - Russian and Turkish influences alike. This part of the Balkans, which atteins some strategic objectives, seeks to become part of the Euro-Atlantic block - and without a doubt, this fact is against the interests of other big powers, regional or global. First and foremost is Russia, but also Turkey, both of which try to hinder this by creating alternative scenarios, so I think it is natural. It is difficult to speak of concrete actors, though; it is precisely SHISH that should determine those. It may manifest in many different areas, considering how Russia is also against the further expansion of the Euro-Atlantic blog. The most prominent is the media, and different kinds of blogs, that very often publish reports or materials which are clearly unnatural for an Albanian media. These articles contain information that clearly depict Russian influence and with the aim of changing the public opinion in Albania. It is just as difficult to determine whether political actors fall under certain categories as well, but essential to know that our Euro-Atlantic project undoubtedly goes against the objectives and interests of other sides, such as Russia. [post_title] => FORUM: Is Russian influence real? [post_content] => TIRANA, Mar. 14 - The Greek Foreign Minister Giorgos Katrougalos said in a radio interview on Thursday that negotiations between Greece and Albania on a number of important issues have slowed down also due to Albania’s deadlock - something official Athens takes in consideration. Another reason Katrougalos mentioned when asked on the progress of Albania-Greece negotiations and the interrupted dialogue, which had taken off when former Albanian Foreign Minister Ditmir Bushati and former Greek Foreign Minister Nikos Kotzias were in office, was that the Greek government was expecting a clearer answer on greek minority issues. He mainly referred to two laws related to the minorities’ property protection at the front of the Himara coast and the right for self-declaration that they are part of the Greek minority. “For the moment, we’ve received some answers from the Albanian side, there is a “fusion” of negotiations, but it is premature to say there will be a positive or negative result,” he said. Katrougalos added the Greek side wants to see an improvement of bilateral issues between the countries and for Albania’s EU path to open. Up until last July, Athens and Tirana were conducting a number of head-to-head meetings through Kotzias and Bushati, in order to reach agreements on a number of open-ended issues between them, accumulated through the years. Agreements were actually reached on building cemeteries for the Greek soldiers who died in Albania during WWII, the apostille stamps, while the abrogation of the War Law with Albania is still expected by Athens. Meanwhile, the Greek side removed any possibility that the Cham issue would be on the table for discussion, while retaining rights to negotiate greek minority issues. Nonetheless, the issue that was most debated by political actors from all sides of the spectrums, experts and the public opinion alike was a new maritime border deal between the countries and the lack of transparency that accompanied the negotiations between Bushati and Kotzias. The negotiations to reach a new maritime border agreement that would finally divide the naval space shared by the countries were promoted publicly by both Greek and Albanian Prime Ministers Alexis Tsipras and Edi Rama, despite the lack of information on the negotiators and the non-functionality of Albania’s Constitutional Court under the ongoing justice reform process. The functionality of a Constitutional Court is particularly important concerning the maritime border deal, since the previous one - negotiated by then ruling Democratic Party and former Prime Minister Sali Berisha - was rendered useless by Albania’s Constitutional Court for violating the country’s interests and the constitution. In context of Albania’s frozen Constitutional Court under the lack of judges and prosecutors, President Ilir Meta had stated that no agreement would be decreed on his side without a court, only to have Rama disagree about its necessity in ratifying the deal. However, Rama and the Socialist government have had to face many challenges in addition to the Constitutional Court freeze, including the massive university student protests last December which forced him to reshuffle a big part of his government cabinet, among whom Bushati, and the opposition protests which have, as of late, left the parliament without a functioning opposition. However, asked concerning the division of territorial waters between the countries, Katrougalos said this is the one issue that will be finalized despite the progress of negotiations, as confirmed by Tsipras himself, part of a similar negotiation that will take place with Italy and Egypt as well. [post_content] => March 13 - North Macedonia Prime Minister Zoran Zaev visited Albania and his counterpart Edi Rama on Wednesday, with whom he discussed the possibilities of a closer economic cooperation between the two countries. Rama said that "relations between the two countries have never been better than today, and that countries share an understanding of a common economic zone with maximum border facilities, similar to Kosovo and Montenegro." According to him, the economy of Northern Macedonia grew last year, thanks to foreign investments and regional cooperation, bilateral trade exchanges with Albania - also signaling the EU that Skopje and Tirana are getting ready for membership. Bilateral trade exchanges have been on the rise. Meanwhile, some infrastructure investments on both sides of the border will help to improve circulation and cooperation between the countries. Albania and North Macedonia also agreed to facilitate the transit of people and goods on both sides of the border. Fifteen months ago, a joint meeting of the two governments was organized, and by the middle of this year a second meeting is being prepared between them. Albania was among the first to ratify North Macedonia’s NATO membership, a process expected to be completed by the end of the year. The two countries are also on a common path towards the EU, and both leaders believe the EU will open accession negotiations in June, with Zaev saying he believed the union would be positive in its answer. 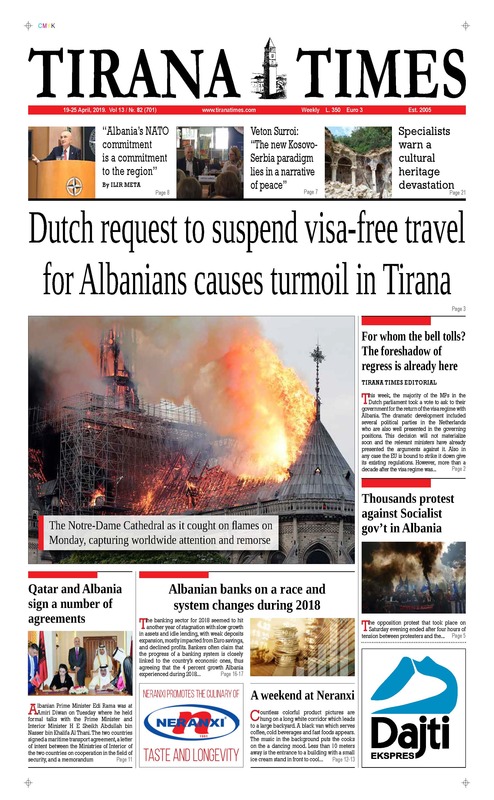 Last week, Tirana Times and a number of other media reported how British journalist Alice Elizabeth Taylor was denied her residence permit renewal under allegations of ties with Russia and her writings, which were often critical of the government. According to the COE, Taylor wrote about vote rigging in the country, violent protests, the government’s links to organized crime and money laundering. “Asked to comment about the state of corruption in Albania and the current developments in the country, Alice Taylor said to Russia Today that allegations of corruption can easily be documented with evidence showing links between the current government, organised crime, money laundering and drug trafficking. In her statement, she also questioned the fairness of the 2017 elections which confirmed Edi Rama as Prime Minister for a second term,” wrote the COE. It was for this reason that a dozen of government-affiliated portals started publishing photos and articles accusing Taylor of being sponsored by Russia, while her partner, with whom Taylor is expecting a child, was also targeted on social media. Following these developments, Taylor herself later reported in social media her residence permit renewal was rejected “with orders from above”, after first having been approved by the Migration Office. Albanian authorities rejected Taylor's claims that Albanian officials refused to renew her residency permit due to her profession and her criticism towards the government, however Taylor has said all her statements so far are well documented and dated. An official source told the Voice of America that delays in the decision to renew the permit are only related to the procedures and that in this case there have been several violations. Meanwhile, Taylor herself has not only refuted the authorities’ claims, saying she has a long list of documentation proving the dates she submitted the documents were well-within the legal limit and that, what’s more important, the migration office approved her permit renewal once only to withdraw it again with “orders from above,” as her partner was told when he went to pick it up. 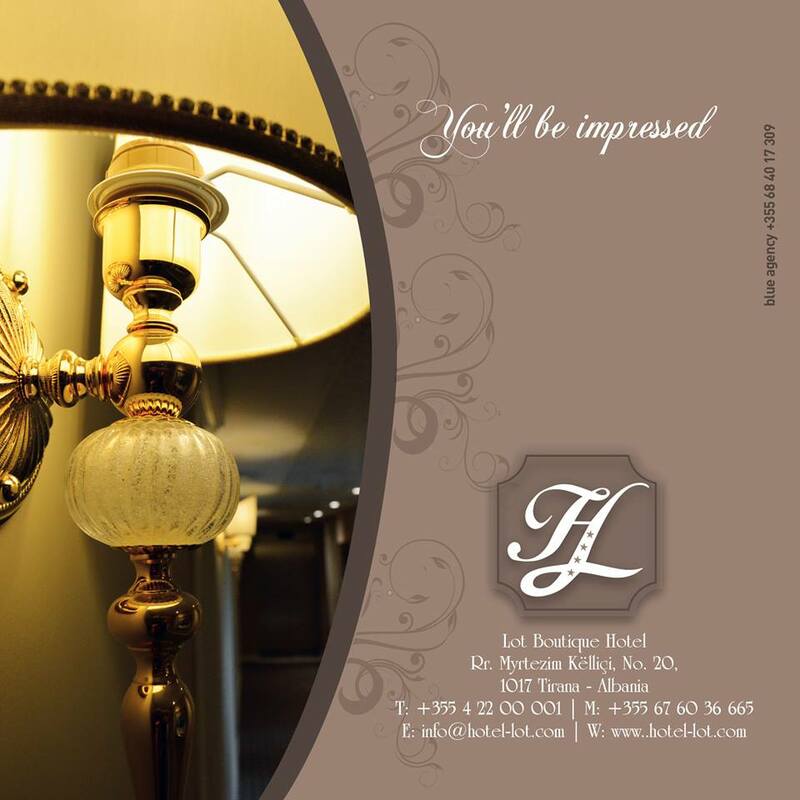 “I filed all the documents under the lawful procedure. They told me they were OK, they had everything they needed and that everything was fine. I also made the payment, which was the last step of the process,” Taylor said. Nonetheless, Taylor’s articles accusing the Rama government of corruption did not come of nowhere, but were actually mainly based on investigations conducted by a number of trustworthy media such as the Voice of America. “I wrote about the corrupt connections that surfaced in the Voice of America, phone call interceptions during the past elections. I wrote for the opposition protests and for suspicious tenders, I wrote about environmental damage,” Taylor said. Taylor is residing in Albania and has been instructed to leave in order to start all the applications from the beginning to the immigration office, although her medical report says she can not travel because of pregnancy complications. In addition to the issues Taylor has reported, media freedom has also been receiving many blows from the Socialist government. This led to four international organizations dealing with freedom of speech calling on Rama to drop amendment of two draft laws that foresee registration, surveillance, fining and banning internet media portals, introduced by Rama under his “anti-slander” package, back in December. [post_content] => TIRANA, Mar. 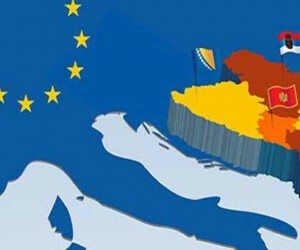 7 - Although the next decision on whether the EU will open negotiations with Albania will be taken in June, EU officials are not yet convinced of the government’s progress regarding the country’s fight against crime and corruption, demanding that the process in these areas continues. EU Enlargement Director General Christian Danielsson urged Prime Minister Edi Rama on Thursday to pursue reforms in all areas, and in particular in the fight against crime and corruption, for Albania’s bid to be convincing in June. “Very opening conversation with Prime Minister Edi Rama on the current political situation and reforms. Albania has to continue to deliver in all reform areas, and in particular on fighting crime and corruption, to make a convincing case in June, when EU member states will review the process,” Danielsson wrote on his Twitter account. Under Rama’s governance, Albania has been denied the opening of accession negotiations three times so far. During his visit to Albania, Danielsson met with a number of political actors from different sides of the political spectrum, as well as members of the Justice Appointment Council, where full EU support for their independent and impartial work was reiterated. During his meeting with opposition representatives who have resigned their parliamentary mandates and are holding national anti-government protests for almost three weeks now, Danielsson was in line with previous EU representatives’ statements condemning the oppositions resignation from parliament. “Constructive meeting with representatives from opposition parties on the current political situation. Albania faces challenges but the only democratic way to solve issues remains to engage in Parliament. Incitement to violent actions in protests is absolutely unacceptable,” he wrote, referring to the last protest the opposition called when the government held an out-of-order parliamentary session. During that protest, some protesters threw rocks at the parliament’s hall and attempted to physically stop two Socialist MPs who were late for the session enter the building, however police also used tear gas against the crowd that was gathered there. At a press conference for the media, Danielsson highlighted that constructive dialogue among all sides is necessary. For this reason, Danielsson emphasized the need for cooperation. “I think it should be emphasized what Mogherini and Hahn said, that this boycott is counter productive and undermines the integration processes. It is important for these protests to be peaceful and those who organize them to be restrained and not to incite violence,” Danielsson said. [post_content] => TIRANA, March 6 - The ‘Friedrich Ebert’ Foundation launched its 2018/2019 study on Albanian youth on Wednesday, based on a national survey that interviewed 1,200 youths aged 14-29 to bring interesting findings in fields such as education, employment, migration and the ever-pressing question of why Albanian youth wants to leave the country. According to this year’s study, based on fields such as leisure and lifestyle, family and friends, mobility, education, employment, politics and some confidential questions, even after thirty years of transition, family and society remain stable tools of emotional and economic support for Albanian youths. However, the notion that youth are looking to reunite with some family members in their desire to move abroad is a misconception according to the study’s authors. Actually, the study shows Albanian youth mainly wants to leave the country for a better living standard - not only in terms of education, but in terms of their general well-being and the quality of services they can receive as citizens of a EU country. Some of the most striking results of the study show that 40 percent of Albanian youth wants to leave Albania for a better living standard - especially in Germany. 40 percent would like to work in the public sector and 44 percent in the private sector. Only 22 percent of Albanian youth have been doing voluntary work in the past year. 80 percent consider the country’s fight against corruption essential. 68 percent of youth would participate in the future elections, while 92 percent are in favor of EU membership - 32 percent think this will happen within ten years. However, concerning EU integration, Albanian Institute for International Studies researcher Alba Cela also noted the majority of Albanian youth thinks EU integration will happen soon - a disillusionment coming from the fact they are not properly informed of EU integration processes. The most popular destination among youth remains, as in previous years, Germany. Following comes the UK and France, while previous options such as Italy and Greece have completely left the race. According to Cela, when youth answered the question of how they see their personal future in ten years, they appeared optimistic, while when it comes to Albania’s future they don’t express the same optimism. This, according to the study, shows youth is willing to change their personal lives, but not the society they live in and this can be another answer to the question of why Albanian youth wants to leave. “It is interesting that the Albanian young people who want to migrate are prepare to be model citizens, learn the language and excel at their work in their host country. There is a lot of potential at this motivation which is not being used for Albania and its own development,” Cela said. Among three groups, the smallest part of youth doesn’t want to leave the country, while some have an average, not entirely specified desire to leave. Meanwhile, 43 percent of Albanian youth are very decided to leave. Moreover, those who want to leave believe it will happen within two years and that they will never return.Only a small part of youth considers emigration as a transitory phase, or as something impermanent and most want to leave for good. It was noted that only one third of the youth regularly spends time reading books and 19 percent only does it occasionally, while the other half of those surveyed said they either read very rarely (28 percent) or not at all (22 percent). Gender separation is also still very visible among Albanian youth, with as much as 28 percent of girls never or very rarely going out with their friends, as opposed to the five percent of males who don’t. In line with this is the considerably smaller percentage of youths from rural areas going out, while also being affected by the youth’s economic situation. An interesting part of the study involved the findings of the confidential questions, where one third of youth, the majority over 25, said they are cigarette smokers, while almost no one accepted they might smoke marijuana. Moreover, half of the Albanian youth is sexually active, but only 30 percent of them regularly uses protection. Similarly, approximately half of youth shares considerable nationalistic feelings and fixed ideas on what the “real Albanian identity” is and to what foreigners should adjust to. During the presentation, it was highlighted by researchers these nationalistic sentiments should be addressed to further identify whether they could turn to something that could facilitate conflictual or violent sentiments or are simply a version of patriotism influenced by factors such as media, education and widely shared stereotypes.